Looking for a seashell craft to do with your preschooler? 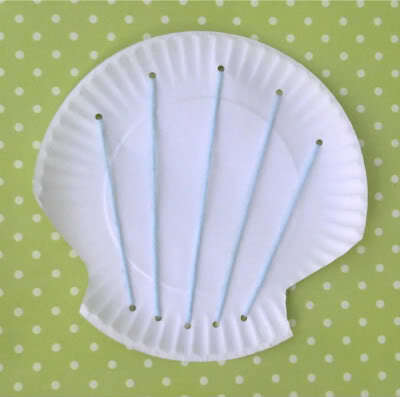 This paper plate seashell helps preschoolers with their fine motor skills and is really easy to make. My son made this a while back in class a while back, but it is still one of my favorite summer crafts. You need 1) a hole puncher 2) a plain white paper plate and 3) scissors and 4) any color of yarn. Voila... You have a seashell! Want more fun summer crafts and activities for tots, preschoolers, and older kids too? Follow me on Pinterest. Well, hello there! It's been a while since I posted a Kid's Co-op activity collection, but I thought this would be a perfect time to get back on track. Like many of you, I have been on vacation over the past couple of weeks. I have many upcoming posts to share about our adventures. We went to quaint medieval villages, world-famous soccer stadiums, an immense castle that was built in 1068 and so much more. It was a very unique vacation full of family, friends, rolling green hills, cups of tea, weddings, quite a bit of traffic, and, of course, memories that will last a lifetime. Any guesses on where we went? Before I get into more details of our trip, I am truly enjoying the serenity of being home. The kids are in their element and are much more relaxed than they were while travelling. I'm cherishing the sounds of home: my kids playing in the yard, the birds chirping and the sound of the crickets. It is so peaceful, and, after developing pneumonia at the end of our trip, this is just what the doctor ordered. I am beyond thrilled to have two weeks with only a handful of things on our family schedule. I expect that many folks are still on vacation (in which case, I hope you're not reading this blog), but there's also lots of moms at home enjoying their last few days of summer break. If you're looking for some fun, things to do with the kids, the Kid's Co-op is a great place to be. Let's get started! Sometimes I feel like our backyard is a bird sanctuary. We're lucky to have bright red cardinals all the time and we have even have seen hawks and turkey vultures too! So, naturally, we're drawn to easy bird crafts. My son learned how to make this paper plate seagull at preschool and I'm excited to share it with you. It's so easy and perfect for a beach themed preschool lesson. Here's a quick step-by-step photo tutorial! Take a plain white paper plate. Draw a head shape at the top of the plate with pencil or crayon. Then, fold down the wings! It's starting to look like a seagull, isn't it? The last step is just adding detail. Add little feet, a beak and eyes. If you have silver glitter, it looks great on the wings, too! Doesn't it look cute? This is one of my favorite easy preschool summer crafts. You can find even more simple summer kid's activities on my Summer Fun Pinterest Board. If you make anything from there, let me know how it turns out. I'd love to share your experience on the blog or facebook page! Welcome to this week's edition of the Kid's Co-op! My kids have been coming home from school with different craft projects for years, and the hand & foot print crafts are always some of my favorites. Their little hands and feet grow so fast, it's nice to capture this moment in time. 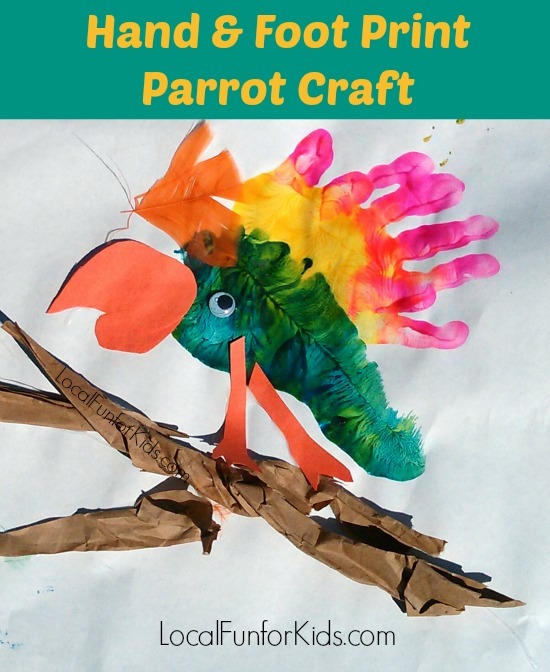 This vibrant parrot craft is super cute, and the colors are perfect for summer. What do you think? It always amazes me how much paper and plastic waste there is in modern packaging. Our many recycle bins are always overflowing and I'm pleasantly surprised when I see companies that make an effort to downsize their packages and reduce waste. It's also nice to see more and more crafts for kids made with recycled products. One thing we always have in our recycle bin is thin cardboard boxes and they seem to accumulate. My son came home from preschool one day with this really cute recycled robot craft. I have always been impressed with some of the art projects my son does at preschool. This one is really easy and I love the results. Being a mom is tough. Just when you have your kids figured out, they go and change. They grow, their personalities evolve, they get smarter and more curious. Now that my kids are 5 and 7 years old, they are asking more complex questions every day. I feel like they expect me to be a human encyclopedia. So, this week on the Kid’s Co-op, all of the science-related ideas really caught my attention. I feel like I need to step up my game and teach my kids things they would never expect me to know. We can learn new things together. Groundhog Day Song to Celebrate Early Spring! It's official, an early spring is on its way! Pennsylvania's own "Punxsutawney Phil" emerged from his dwelling at Gobbler's Knob this morning and did not see his shadow. Groundhog Day, February 2nd, is a popular tradition in the United States. It is also a legend that traverses centuries, its origins clouded in the mists of time with ethnic cultures and animals awakening on specific dates. Myths such as this tie our present to the distant past when nature did, indeed, influence our lives. It is the day that the Groundhog comes out of his hole after a long winter sleep to look for his shadow. If he sees it, he regards it as an omen of six more weeks of bad weather and returns to his hole. If the day is cloudy and, hence, shadowless, he takes it as a sign of spring and stays above ground. Here's a really easy Groundhog Day song for kids to brighten up the day. It's funny how things change in life. Before the kiddos came along, I'm sure I thought Valentine's day was all about me. What little surprise will I get? Where will we go to dinner? What will I wear? But, now that I'm a mom, it's about the giving vs. the getting. Don't get me wrong, I would love a beautiful bouquet of flowers on Valentine's Day, but it has definitely become a family celebration - and that's okay. This week, I'll be focusing on the ABC's of Valentine's Day. What does that mean? 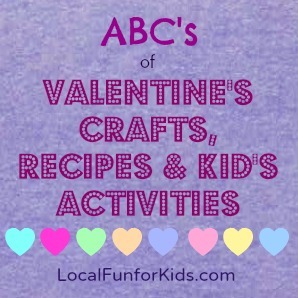 Throughout the week, I'll be highlighting different kid-friendly ideas for Valentine's Day from A-Z. 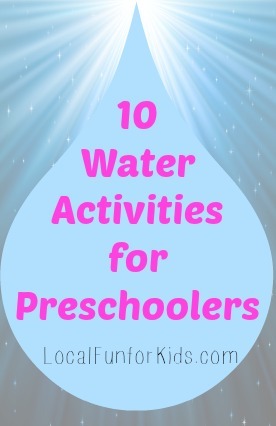 I will be including crafts, recipes and activities for toddlers, preschool and elementary school age kids - with a few ideas for moms mixed in as well. A is for Art - Everyone knows the traditional ways to use crayons for art, but for a unique new twist, try this Melted Crayon Art using crayon shavings. B is for Bag - You've probably heard about 'Sensory Bins' before, but you have to check out this Valentine sensory bag craft. D is for Doily - I truly love being the mom of boys, but every now and then, I see a blog post which makes me wish I had a little girl to craft with. This is one of them! Check out this blog post to see how to use a pre-washed t-shirt, a doily, and some fabric paint into a totally adorable t-shirt for your little girl. Read more about these DIY Valentine's shirts here. E is for Eyes - Recycle those old toilet paper rolls and make these adorable Heart Shaped Binoculars. F is for Filter - If you want a completely unique Valentine for your kids to hand out at school, take a look at these Heart Coffee Filer Zipper Pulls. They are fun, fashionable and functional! G is for Glitter - Grab your glitter, contact paper and construction paper to make this Glitter Window Heart Craft with your Preschooler! J is for Just let them lead the way - Isn't there a famous saying about the best intentions that seem to go astray? When it comes to Kid's Valentine Cards, maybe it's just best to let your child lead the way! Read more about this with B-inspired Mama. Day 5: Valentines Wall, XOXO, Yummy Pastries, and Wild Zebras! Be sure to check out some of the other bloggers participating in ABC's week too. Everyone is packing up and heading out! Since so many families are leaving for their summer vacations right now, I decided to gather some of the best tips for long car rides and put it all in one post. I have to admit that, I think the DVD players kept my kids quieter than anything during our 8+ hour long journey to Cape Cod, but, many of these other tips were life-savers too. For example, don't underestimate the power of a quick stop at a rest area. Having a potty break, walking around for 10 minutes and eating a popsicle made a world of difference when my 4 year old was getting extremely fed up of being in the car during our drive home. 2) "Rent Redbox Movies and Return Them In Other States Along Your Route. You can use the free Redbox app to find kiosks near wherever you may be" says Heidi of Free Fun In Austin. This is much cheaper than buying new DVDs and since it's so affordable, you can really stock up! 3) Play Games - Joey, from RealMomMedia.com, reminded me of all the fun car games you can play with kids. The license plate game is a classic. You can also count things on the side of the road (like animals or objects), make Road Bingo cards, and play I-Spy. 4) Expect Delays - As soon as you become a parent, you learn that everything takes longer with kids. "Just Just know that 7 hour trip will become 10. Consider when you leave and factor in traffic," Chrissie from London Mod Girl. 6) Books on tape are ideal for preschoolers and Early Elementary age kids. Susan reminded me that I can borrow audio CD's from my local library. Susan said that when she went on vacation "Sometimes the kids were so engaged they refused to get out of the car." A few titles to check out include: Magic Tree House, Junie B. Jones, The Freddy series, and The Castle In The Attic, Winnie the Pooh with Stephen Fry, and Skippy Jon. Here is a great resource to find audio books for kids. 7) "Take breaks every 1.5-2 hours depending on how long they can last. Let them stretch, have a snack, potty" - Brandi of One Great Mom. 9) Make a Sandpaper & Felt Travel Board - Melinda from Look What Mom Found told me about this sensory activity from Gummy Lump which you can make with this Sandpaper Felt Board Tutorial. 11) Get Creative - It's amazing how a few simple Wiki Stix or pipe cleaners can really entertain a kid. Have a contest to see who could create the coolest thing. 14) Before you go, download online kid's books to your Kindle or IPad. Here's a great post about finding online books for kids. 16) Don't be afraid to abandon all rules - Heidi says "We did Texas to Canada and back this summer and I abandoned all rules/ It was a DS + movies +iPod + iPad + snacks children's paradise. All electronics all the time. Everyone was happy for all 50+ hours (because I usually don't let them have that much screen time, and we wouldn't let them play at all while we were in Canada). If you have specific questions about a certain area, just ask. I find that the best tips come from my friends, family and other parents who have already ventured to my destination. They are your best source of information! There are also tons of local blogs from moms that are full of tips as well as helpful travel sites such as Trekaroo.com. What is your best tip for long car rides with kids? She sells seashells down by the sea shore. Sanibel beaches are full of the most beautiful sea shells I have ever seen in my life. Many of the shells I picked up on the beach were tiny. Just like snowflakes, each shell was different and special in it's own way. I kept finding shells that were a shades of red and white. My 6 year old and I nick-named them 'Strawberry Shortcake' shells. Every time we found a Strawberry Shortcake shell we'd get so excited. But, what do you do with so many beautiful shells? We used a basic recipe for homemade clay using whole wheat flour, salt and water. Mix up the ingredients until they are the consistency of a bread or pizza dough. If it feels too dry, add a little bit of water. Or, if it seems too sticky, add a little more flour and salt (in equal parts). We used a cookie cutter to form a small oval shape. Then, we pressed the shells into our oval shaped clay forms and created little keepsakes. We created a small hole in the top by pressing a straw through the clay. Finally, we dried them in the toaster oven at 250 degrees until they hardened. What's your favorite summer themed craft for kids?